If you have a large outdoor area to illuminate, few upgrades will save you money like installing LED parking lot light fixtures. Mel Northey can help you reap those savings, all while helping you greatly reduce your carbon footprint. Supermarkets, car lots, apartment complexes and more often have outdoor parking that needs to be illuminated all night. While you wouldn’t leave the lamps on in your home all night due to the cost, here it is necessary for the safety and security of customers, employees, residents, and for the vehicles themselves. (Check out our article on the top three reasons to have great outdoor lighting!) Sports complexes are another area where nighttime illumination is a crucial part of their usage and performance. Imagine a night game at your local baseball field with an even, bright glow that makes it easy for the players and the spectators to see what is going on. Traditional poles for parking lots often entails the use of high intensity discharge (HID) sources like metal halide or high pressure sodium. These bulbs are known to produce areas with significant brightness, measured in lumens, while other areas are in shadow. They also consume more energy to produce the same number of lumens as LED bulbs. Light-Emitting Diodes have been around since the 1960s, but have only in the last twenty-five years become a part of efforts to “go green” among consumers and businesses. They are currently the most energy-efficient bulb available on the market. Unlike most other forms of lighting, very little energy is used up as heat. This means far more illumination can be produced per watt of energy. Because of the way these bulbs work, the quality is quite a bit more consistent across the area of illumination. Unlike metal halides, which take several minutes to reach maximum brightness, these newest bulbs are up and running nearly instantly. Just how efficient are these newer bulbs? It depends on what you are replacing. Typical HID bulbs have an approximate efficiency of around 120 lumens per watt. However, other factors such as beams trapped within the lamp (instead of being projected to the ground where it is needed), the type of material used to protect the lamp, and the outside temperature can result in an actual efficiency of 30 lumens per watt or less. By comparison, LEDs can be 100 lumens per watt or better. Because they are programmed to focus the rays to where they are needed, there is far less trapped within the lamp. While the covers do reduce output, the resulting loss is far less than most typical covers. Even when taking temperature into consideration, final efficiency stays around 50 lumens per watt or better. Upgrading all your lamp-posts is a big expense, but well worth the investment. Even though metal halide fixtures cost quite a bit less, most businesses can expect for these state-of-the-art bulbs to pay for themselves within three to six years, depending on whether the installation is new or retrofit. This isn’t at all surprising considering that cutting your energy usage by an average of 50-70% would thus save you that much. One car dealership expects to keep an extra $3000 a month in its bank account after replacing all its lot fixtures with new ones. Upgrading or replacing your street lamps? 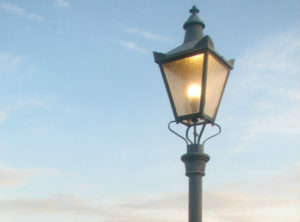 According to Sciencing.com, one city in California upgraded 1300 street lamps and is now saving $60,000 per year. This study by PG&E showed a 57-85% improvement in energy usage after installing new poles at one supermarket, replacing metal halide poles. Not only was far less energy used, but customers and employees reported the illumination was more consistent, and they felt safer. Typical High Pressure Sodium bulbs have a lifespan of about 2400 hours. Metal Halide bulbs have a lifespan of about 6000-10,000 hours. LEDs have a lifespan of about 50,000—100,000 hours. And because of durable plastic housing – as opposed to glass – they can withstand the wear and tear that occurs from high winds. They can even handle power surges better than most types of lighting. Motion-sensors can help reduce usage even further, dimming when there has been no movement detected. All of this means that you can postpone maintenance and replacement for a long time after upgrading your parking lot fixtures. And all that longevity and energy efficiency is as good for the environment as it is for your pocket book. You’ll create far less waste by reducing in three key areas: the number of bulb replacements over the course of the life of the pole, the rays wasted inside the fixture, and the energy used. Contact Mel Northey for a consultation. We’ll gladly help you determine if LEDs are right for your parking lots. We recommend having a study done to determine if you have dark spots. A lighting expert can help you figure out exactly how many poles you need at any time. Once you have this information in hand, we can give you an estimate on the cost. The energy efficiency and installation needs of each style will also be discussed to help you make the right choice for your location. This isn’t just about parking lots, either. This type of fixture is also a smart choice for street lamps as well. If you need to upgrade your municipal lighting, consider talking to us. You can plan your upgrade all at once, or in stages to fit your timing and budgetary needs. 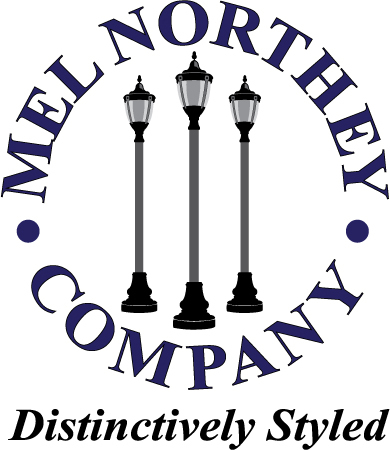 Contact us today for your consultation and quote to upgrade your current poles with LED parking lot light fixtures from Mel Northey; your wallet will thank you. Call our phone at 1-800-828-0302, so we can get started. You can also fill out our Contact Form Here, or even send our friendly team an Email Here.